Relax at the end of a long day with this cozy down alternative comforter set. Made from smooth polyester, this microfiber comforter set is gentle on the skin, and the hypoallergenic polyester fill provides softness. 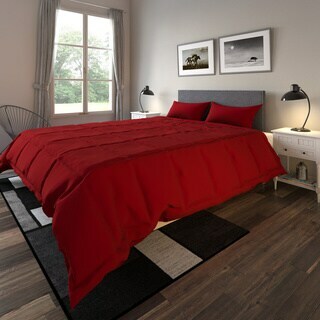 Available in multiple colors, the set features a classic and understated design that blends into both modern and traditional bedroom decor schemes. Pros: Warm, lightweight, the color matched what I ordered (black), its cheap (good value), soft microfiber Cons: Attracts/collects my cat's hair like crazy. Overall, my fiancee and I like our new comforter. We have a queen sized bed and like the comforter to be wide enough to cover the mattress and box spring on the sides, so I ordered the king size comforter. The king size is wide enough for our bed, but it could be a few inches longer. I love my comforter set, it's GREAT! It's exactly what I wanted...It's long enough and wide enough for my bed and very comfortable. The color is wonderful, for it beening describe as full size it need about 6 more inches. It is durable for a platform bed. I bought this as a gift for someone who has a queen-sized bed, but based on reviews saying that the drop over the sides wasn't wide enough to extend beyod the mattress, I bought a King set. That worked out fine for the bed, but the shams had to be shortened by about 8 inches, which I did, and the set looks fine. The color was quite a bit darker than the photo online, that's why I didn't give it 5 stars. The comforter was puffy and looks like it will be easy to launder. For the first time when ordering from Overstock I was disappointed in the order. The quilt was a little skimpy and not quite the color I expected. So if you are ordering for a queen bed, order the king. The king was too small for the king size bed. This comforter and sham set isgreat. I ordered a larger size than my bed because the reviews said it ran small. And it does. Long enough, but not very wide. It is just the right weight and the quality was more than I expected for the price. I purchased the red and it is an a dark red and not at all orangey red. I love the color. The price was great. I loved not having to pay extra for the shams. Great product. We bought this to try to avoid the $$$ of down comforters, but it was a mistake. I'm not sure why they call it 'down alternative' because it isn't fluffy like a down comforter...it just seems like any old polyester filled comforter. The microfiber is ok and soft enough, but it's very thin and cheap-looking. I put it on the bed, and the King sized comforter barely fit our king sized bed - there was only a few inches covering either side...it may have worked for a full sized bed, but as soon as I saw the way it fit and quality I put it back in the plastic case it came in. Also, it shipped from California, so it took about a week longer than my other Overstock purchases. I will be returning it so long as the return shipping isn't more than half the price of the product, but if I could I do it again I would have just sucked it up and bought a real down comforter in the first place instead of this thing. I would not recommend it unless you're looking for a thinner comforter that isn't that high of quality. This comforter set was a waste of money for me. It cost too much to send it back so I gave it to a charity. The description states it is 86 inches - I should have noted that before ordering. 86 inches is too small for most queen beds and definitly too short for a king size bed so don't bother trying to order a size bigger. If you have a really thin mattress you might be able to use it but I would measure very carefully because this is somthting you don't want to have to return. The material feels like a really cheap nylon/polyester, but weight and size are very nice. The color and fabric of the shams is COMPLETELY different than that of the comforter (the comforter is like a grey ivory and the shams are a darker manila color). I know it's a bargain priced item, but I would have expected at least the same fabric! Don't waste your time or effort (having to return it) on this product. This is not the soft microfiber indicated in the description. It is scratchy and collects lint, hair, etc that does not remove easily with a lint brush. Does not resemble picture at all. I ordered the chocolate color and it is more of a washed out light brown not even close to what the color swatch is in picture. The comforter is very thin and runs small for a full/queen size. This is truly a waste of money. The color is an ugly dark red. Not at all like the picture. I'm very disappointed. But this is the first time Overstock.com ever let me down. I have been looking for a black king size comforetr for 2 years now that was not too costly. Whe I went on Overstock.com I took a chance and for $**** bought it. It is soft and well made. I am really enjoying it. Nothing good about this comforter. For the price, I am very disappointed. It is thin, nothing about it seems very high quality, and the cover isn't micro-fiber at all. Fine print on the label says it was made for Anna's Linens. I have been to Anna's before, and wasn't impressed with any of their junk. It's going back. It's a little to thin i was expecting a fuller fill to it like a down comforter is just a little less. It will do for the summer but come winter time i will have to find something a bit thicker. so if your looking for a year round blanket this is not the one for you. It's very scratchy and collects lint and everything else way too easy and using a lint brush pretty much does little to nothing at all, and when I washed it in COLD it started falling apart, I do not recommend! The item information called this a MICROSUEDE blanket. The item is not microSUEDE, it's microFIBER. BIg difference there! Highly dissatisfied, to put it mildly. We appreciate you taking the time to write this review. We apologize for any confusion with the description of the product. This product has always been advertised as microfiber and not microsuede. I love these comforters. I have bought several. They are warm, yet light weight. Thy also was very easily on cold in the washer- no dry cleaning necessary! The person I purchased this for Loved it. Very happy with item, will work well in my bedroom! Easy to care for, washes well. Doesn't pill after washing. Wrinkle free and looks nice on the bed when made up with the shams on the pillows. Purchased as a gift. The recipient was very pleased with the quality and comfort. Microdown comforter set was excellent choice for my sons room. Also very easy to wash and dry. Did not fade and kept its shape. Exactly as expected. Great price & quality. "Is there a stitching pattern on the comforter, or is it just plain?" This comforter has a square design stitched on it. No, other then a straight square stitch to bind it together. "My daughter is looking for purple--the purple color box doesn't show the comforter on the bed. How does the actual color match that swatch?" The actual color is a bright red - not the deep cardinal red that is shown. "Hello--About the microfiber alternative down cover----on the taupe, what color is the other side? Does the fabric feel a bit like suede? Thanks"
The other color is cream and it is like a micro suede. "does the queen come in bright red as well?" The queen size does come in bright red. yes that's why i purchased it. Yes, that's wat I purchased. The Guests in our B & B love this during the Christmas holidays. It is he perfect bright Christmas red. This is polyester, it does not have a thread count. No thread count but it's soft and probably comparable to a 250 thread count. Note, it's a sily texture but it's really a basic comforter--more on the low end. i got it for a teens room. "Is the pink a HOT pink?" In my opinion the pink is similar to a fuschia color.